We use wax casting for creating original designs for your custom jewelry and rings. The concept for your jewelry begins with your ideas, a picture, drawing, sketch or even from an advertisement. First the design is made in wax, and if you choose to, CADs will be generated for more intricate or difficultly detailed designs. Throughout the entire process, you will be seeing CAD images and/or wax models of your design before we complete your project, to insure your total satisfaction. You will have an exciting experience designing your ring and being involved every step of the way – which will insure your satisfaction and value of your new Custom Designed Diamond Jewelry. 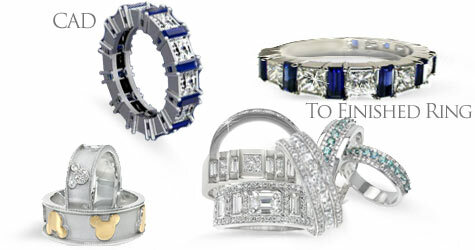 Our staff of custom ring designers will make your dream ring a reality. Budgets are established at the beginning of each project. Computer-aided design (CAD) is the use of computer technology to aid in the design and especially the drafting (technical drawing). Drafting can be done in two dimensions (“2D”) and three dimensions (“3D”). CAD has become an especially important technology as CAD enables designers to lay out and develop work on screen, print it out and save it for future editing, saving time on the development of your ring and/or jewelry. A custom ring wax model is created for you to visualize, touch, feel and change as you become part of the creation process. If necessary we make hardened cast model from the wax, to test for the final look and fit of your custom designed ring. Finally the precious metal is poured, and then the stones are set. Your dream ring is now a reality. Here’s the carved wax [above] of the wedding ring for this ruby and diamond wedding ring set – which will now perfectly complement and match this stunning engagement ring.